Surface water | Infonet Biovision Home. Short description: Surface water is rainwater running off from land surfaces into rivers, lakes and seas which can be collected, stored and utilized through rainwater harvesting. Surface water is rainwater running off from land surfaces into rivers, lakes and seas which can be collected, stored and utilized by a technique called rainwater harvesting. To the surface water structures to collect and store water belong ponds and earth dams such as Charco dams, Hillside Dams and Valley dams. 1) Charco Dam is suitable for flat land, preferable with a road catchment to supply rainwater run-off. 2) Hillside Dam is the best option for slightly sloping land in places where rainwater flows. 3) Valley Dam can be built in valleys flooded with low floods from small catchments. Although this type of dam is the most cost efficient, it is also the type most easily damaged or washed away by floods if it is not properly designed and constructed. 1) They give maximum storage volume for minimum works. 2) The internal and external pressures are evenly distributed and this prevents cave-in of the soil in the walls of the water reservoir. 3) In sandy soils, they can be lined successfully with clayey soil, because the shapes do not have any corners. 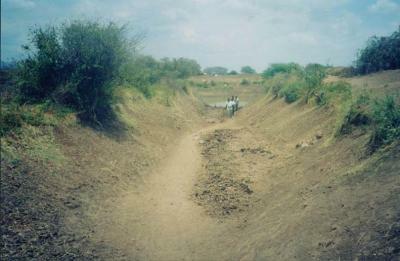 Farmers and cattle owners in semi arid parts of Tanzania build small earth dams known as Charco, or Milambo in Kiswahili. These dams are built in a way, which tries to reduce evaporation losses by deepening the water reservoirs and minimising their surface area. Trees and shrubs are grown on the windy site of the charco dams to function as windbreaks and reduce evaporation. The best sites for constructing charco dams are in natural depressions where rainwater either flows or accumulates during rainy seasons. The soil should, preferably, be deep clay, silt or Black Cotton Soil. Coarse textured sandy soils should be avoided as these are highly permeable and water will drain through them. If seepage is high in charco dams, they can be plastered with clayey soil and compacted using compactors made of tree trunks. Sites with underlying strata of sand, gravel, limestone or fractured rock at a shallow depth may also result in high seepage losses, unless they are sealed with clayey soil. Ideally, a charco dam should be located near to a gully or a natural waterway, which carries water during and after rainfalls, as this water can easily be diverted into the dam. 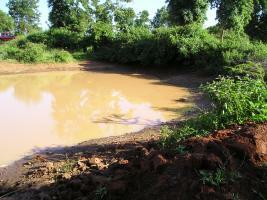 Avoid building dams near or downstream from livestock enclosures to avoid organic and/or chemical pollution. The photo shows the inflow channel to a charco dam seen in the background. Usually, inflow channels have some logs laid across the floor of the inflow channel functioning as steps and silt traps to prevent the water reservoir from being silted up. 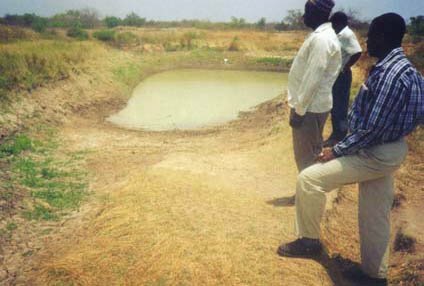 Farmers dig their ponds during dry seasons and enlarge them every year, until the owner is satisfied with the capacity of his dam. 1) A farmer's financial capacity to hire labourers to assist him excavating. 2) The expected volume of runoff water from the catchment. 3) The area available for constructing the pond. 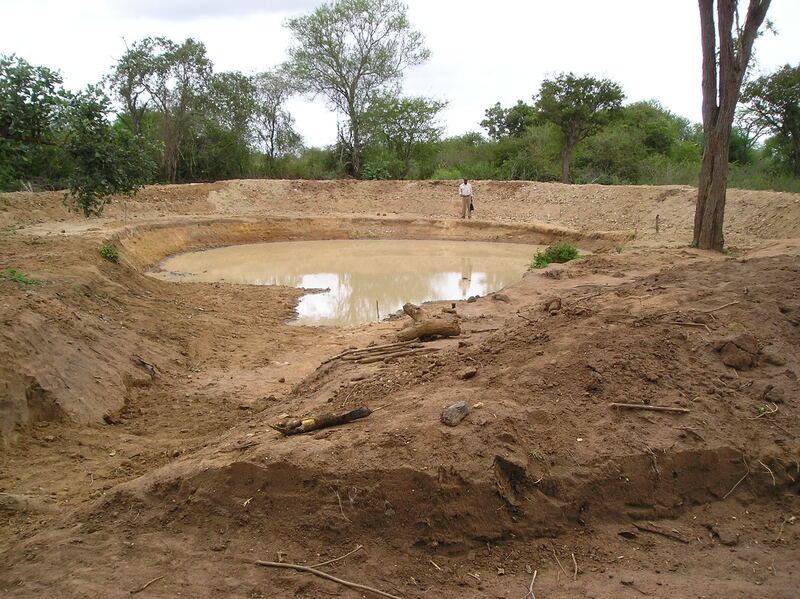 Hillside dams are small earth dams with curved walls built on hillsides and sloping land are the simplest and second cheapest earth dams to locate, design, construct and maintain. 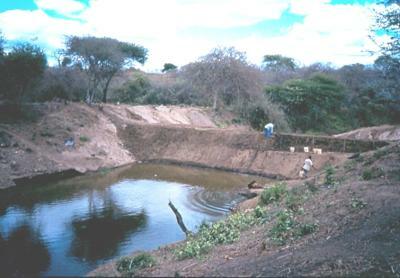 Suitable sites for hillside dams can be found on almost any sloping land that produces rainwater runoff. The catchment can include roads, compounds, roofs, agricultural land and rock outcrops. To avoid contamination of the water, there should not be any pollution sources, such as drainage from villages, slaughterhouses, latrines, rubbish pits, cattle dips, etc. in the catchment area. Despite seepage being considered as wasted water, it can be turned into an advantage such as; facilitating clean water in a hand-dug well that can be used for domestic water, watering livestock, garden irrigation, making burnt bricks, a wood lot, etc. 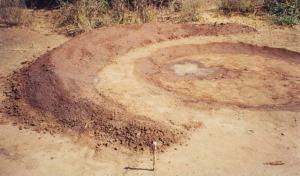 The curved heap of soil, shown above, will become the dam wall, while the excavated pit will be the water reservoir. 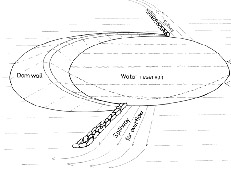 The size of the dam wall and its reservoir depends on the capacity to remove soil from the reservoir and placing it on the dam wall. The gradient (slope) of the sides of the dam wall should be 2:1, which is 2 m width for every 1m of height. An earth dam built in a valley is the cheapest way to create water storage, because the excavation work is less than for Charco dams and hillside dams. However, the gain in cost per volume can be lost overnight by flooding from one heavy thunderstorm or shower, which, unfortunately seem to be bigger and further apart every year. The washout of a dam wall can be very serious and endanger both lives and property. For this reason experienced technical help should always be sought for the design and construction of valley dams which might present a possible threat to downstream households. Nissen-Petersen, E. (2006). Water from Dry Riverbeds. 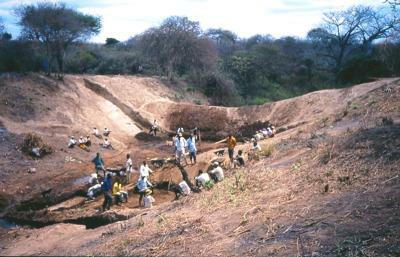 How dry and sandy riverbeds can be turned into water sources by hand-dug wells, subsurface dams, weirs and sand dams. ASAL Consultants Ltd. and Danish International Development Assistance (Danida), Kenya. Nissen-Petersen, E. (2006). Water from Roads. A handbook for technicians and farmers on harvesting rainwater from roads. ASAL Consultants Ltd. and Danish International Development Assistance (Danida), Kenya. Nissen-Petersen, E. (2006). Water from Rock Outcrops. A handbook for engineers and technicians on site investigations, designs, construction and maintenance of rock catchment tanks and dams. ASAL Consultants Ltd. and Danish International Development Assistance (Danida), Kenya. Nissen-Petersen, E. (2006). Water from Small Dams. A handbook for technicians, farmers and other on site investigations, designs, cost estimates, construction and maintenance of small earth dams. ASAL Consultants Ltd. and Danish International Development Assistance (Danida), Kenya. Nissen-Petersen, E. (2007). Water from Roofs. A handbook for technicians and builders on survey, design, construction and maintenance of roof catchments. ASAL Consultants Ltd. and Danish International Development Assistance (Danida), Kenya.